We’re starting this year’s mystery project at my ANG Keystone Garden Chapter. Color A and B can be contrasting or light/dark. You’ll have to wait to find out what direction I’m going! This is on a light blue canvas. It’s fun seeing the various colors people pick & watching everyone’s piece develop. By adding the 2 outer rows as final borders, we are almost done with the mystery project at my ANG Keystone Garden Chapter. But, there is something mysterious that will “be revealed” next month before we finish. Hmmmm. 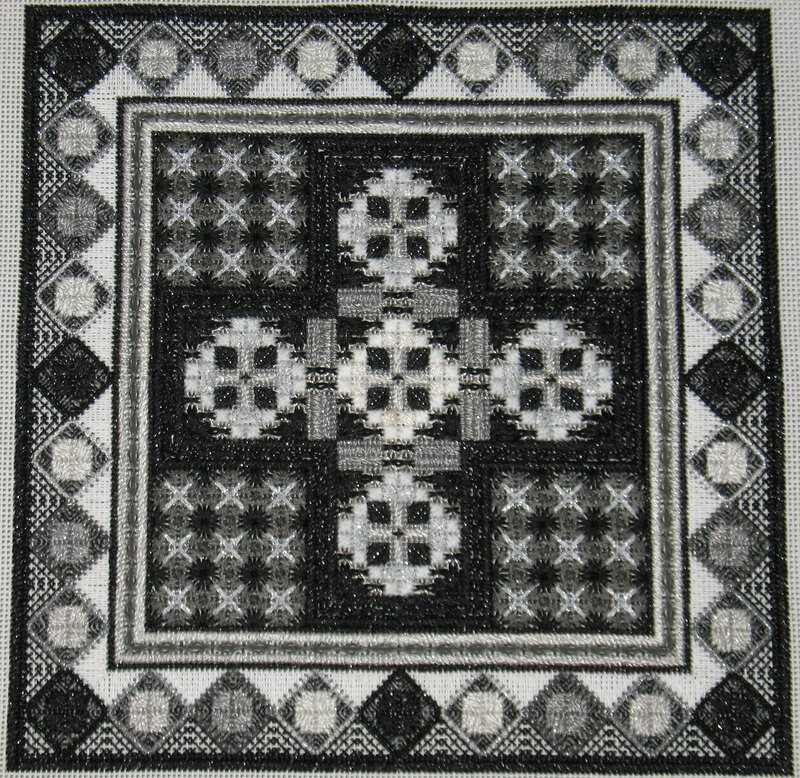 Wednesday night at our meeting, I got the first border done and last night I added the outermost border. And, thanks to the longest 9-inning post-season game in major league baseball history, I added beads in the 2 large diamonds. They were optional but I liked that they made the top bluer and the bottom greener than the threads alone. I was worried about the top having more beads than the bottom and being top heavy. But, the bottom green ones are larger Mill Hill Beads and the top blue ones are smaller seed beads from Beads By Blanche (via Trish V who purged her stash last year). Of course, I could always turn it upside down had it been top heavy. I think it is looking great! I was remiss in getting my finished “Promise of Mystery” designed by Sue Reed to the framers until late 2011. It got stuck in a corner & I forgot about it. But, I got it back shortly before Christmas! 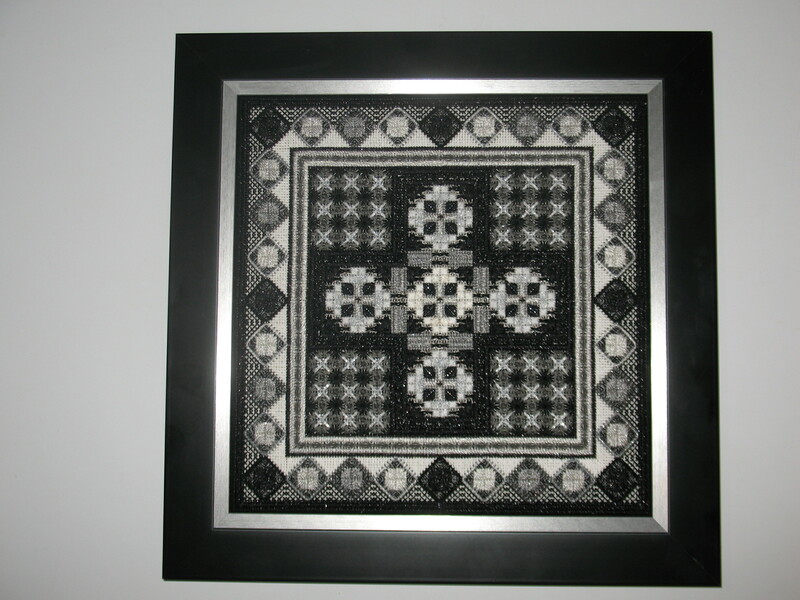 It is in a simple frame with an inner silver border & outer black border. 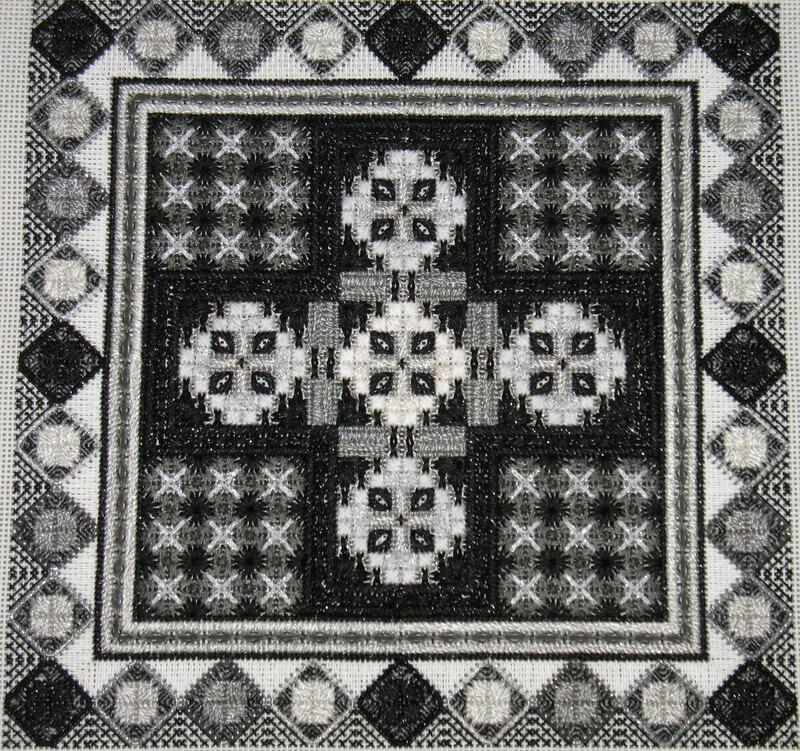 The American Needlepoint Guild provides a stimulating and challenging environment through nationwide educational programs, a national publication, and Seminars & Exhibitions in which members: develop creative potential, serve public and professional constituencies, support faculty members in the joint pursuit of excellence in teaching and research, and promote intercultural understanding through the needle arts. 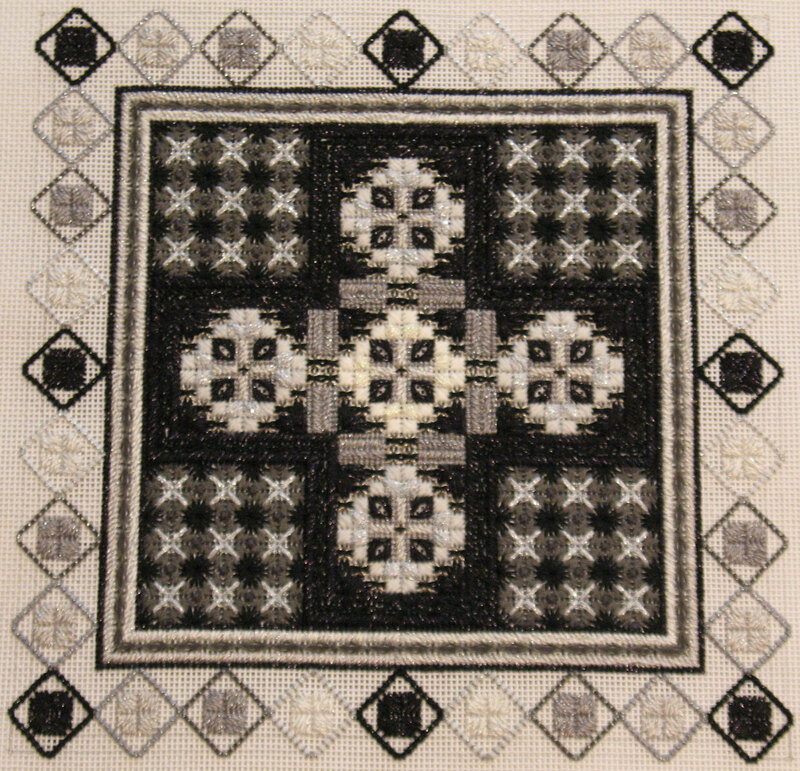 While this is the only one I’ve done (to date), I really appreciate the many designers over the years & the behind the scenes work that goes into the Stitch of the Month year after year!! I’m very happy that it is finally completed & hanging. Yes, I found a spot for it!! 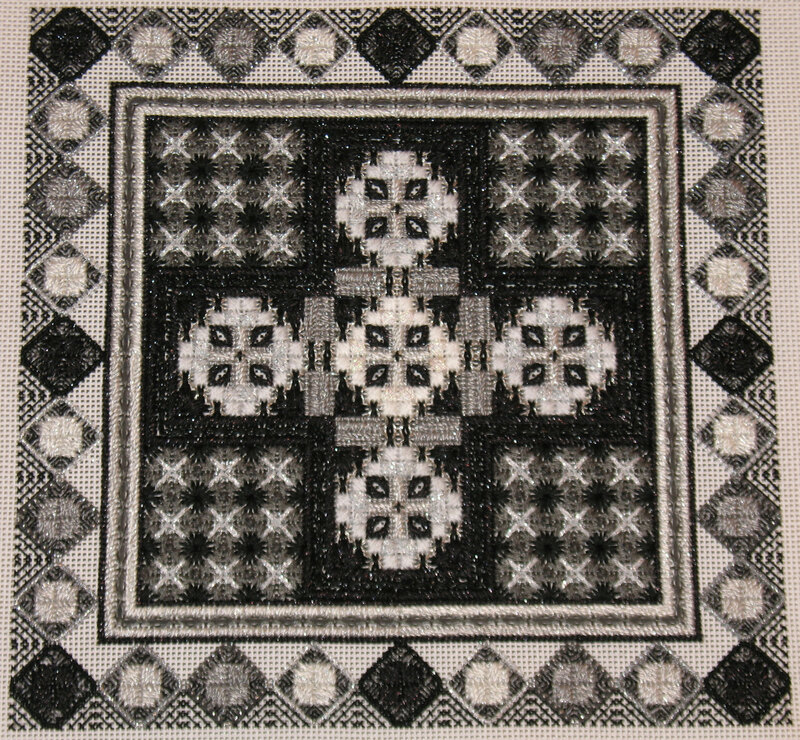 Thanks to the Dec 26th snowstorm, I finished this in 2010! I love the finishing touch with the beads & how they bevel up just a tad. There has been great discussions lately about what part of the piece folks prefer: starting, middle, or end. Each has good & bad points but I lean towards preferring starting. I love the designing & planning of threads. Many times I’m so anxious to get to the next piece that I don’t get the just completed piece finished (put in a frame, etc). Hopefully, we’ll be able to shovel out soon & go purchase a frame – don’t know where to put it yet! 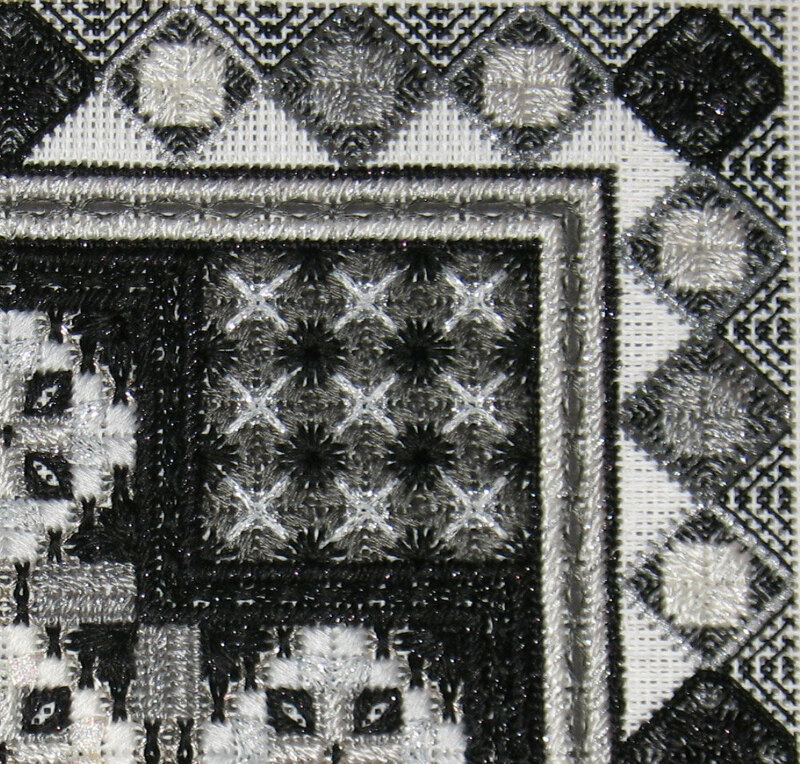 Faced with 2010 running out of days, I decided to use straight stitches on the inner portion of the border. 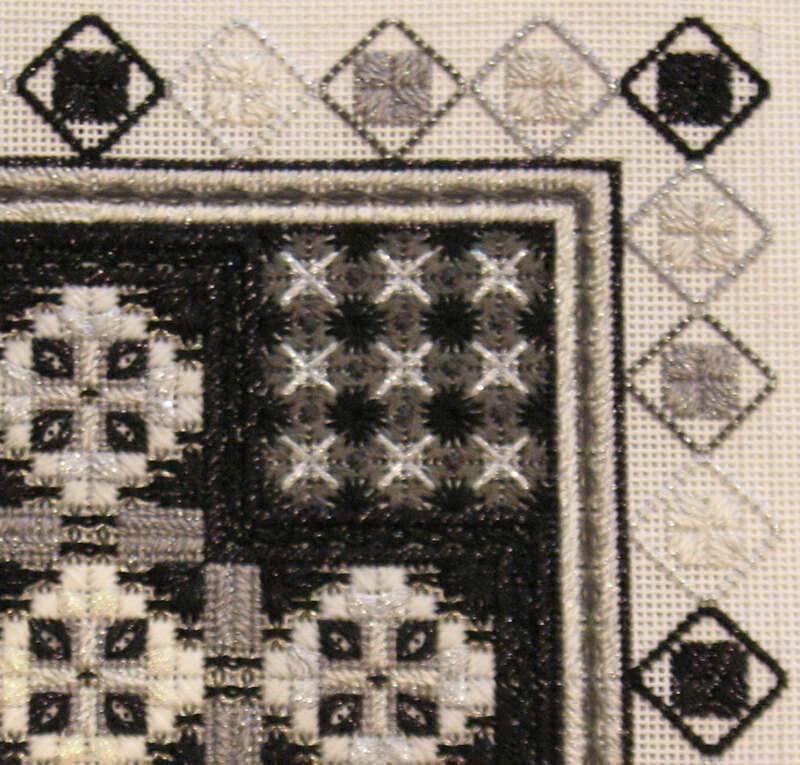 Initially, I stitched them at an angle like the outer border but it was too heavy-looking compared to the open black area (you’ll have to take my word for it because the picture really didn’t show it well enough to post). 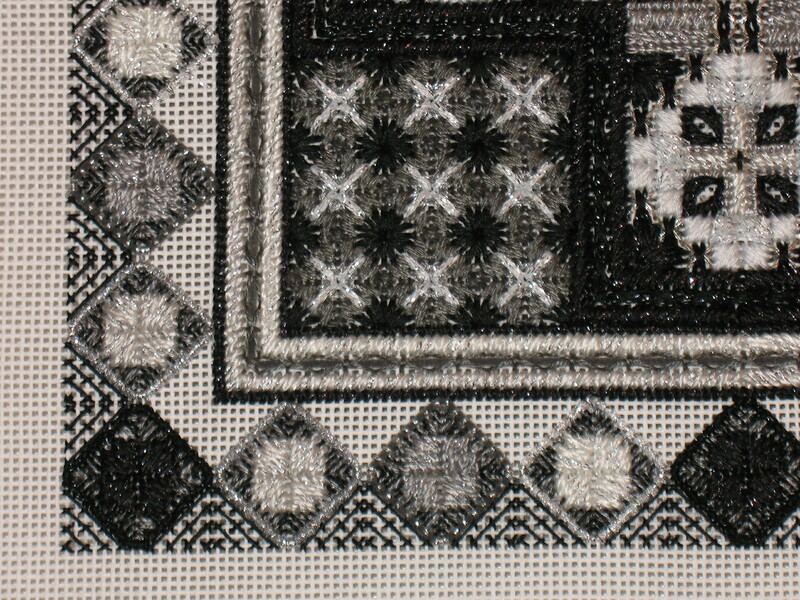 So, I slept on it, ripped it out, & switched directions to minimize the effect of stitching in that area. 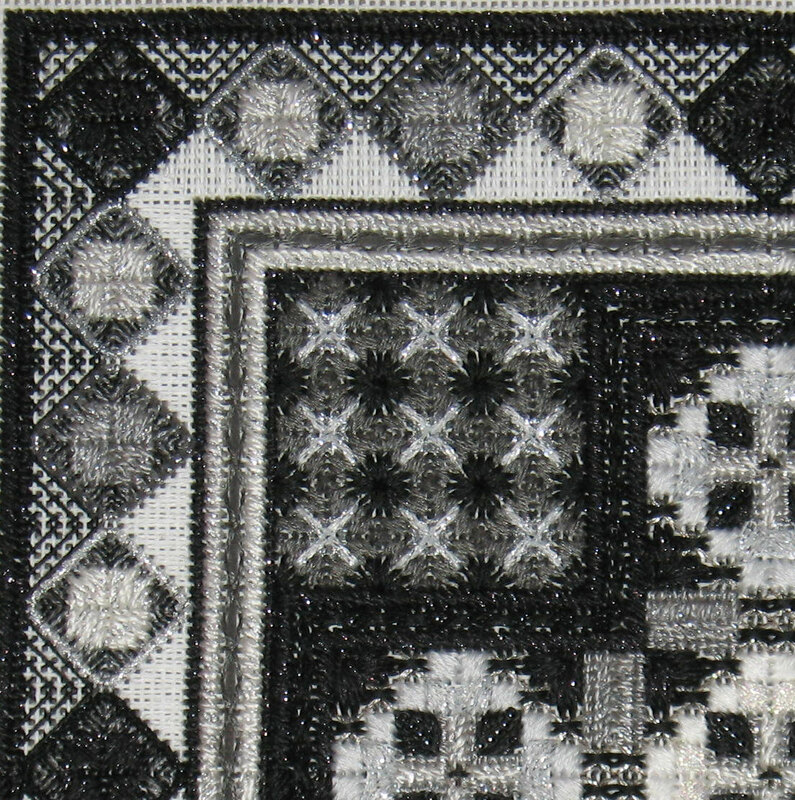 The threads kind of fill in the shaft between the canvas threads making the white stitches less prominent. And, it worked up quickly so I can get to the last border!! October had a lot of couching which I found quite time-consuming. And, I think I got my Family A, B, & C out of order for this month but it looks fine. I see November has more couching as well. But, we are coming to the end soon!